A salon visit in the middle of the week was something that came up quite suddenly but a welcome one for sure. Caught between several deadlines, this was a break that was well timed and gave me a quick relaxation as well. 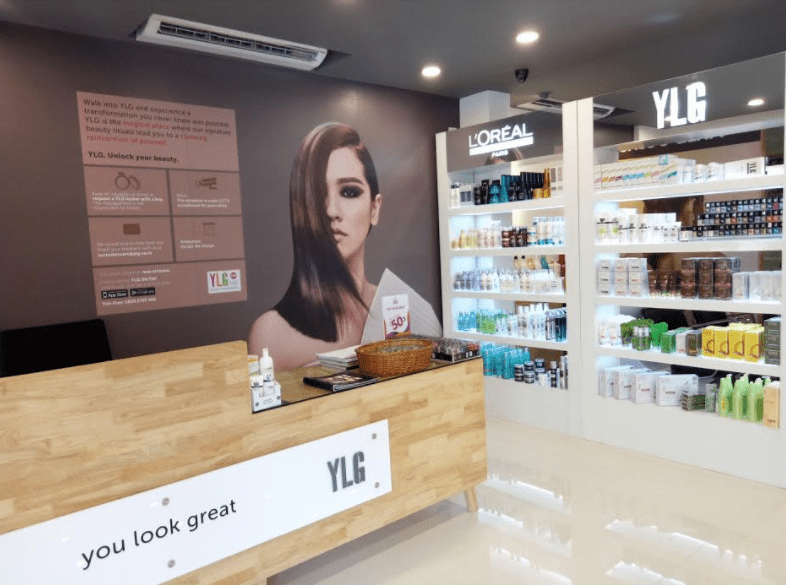 At YLG Salon, there are myriad treatments that are aimed to make you feel and look good. 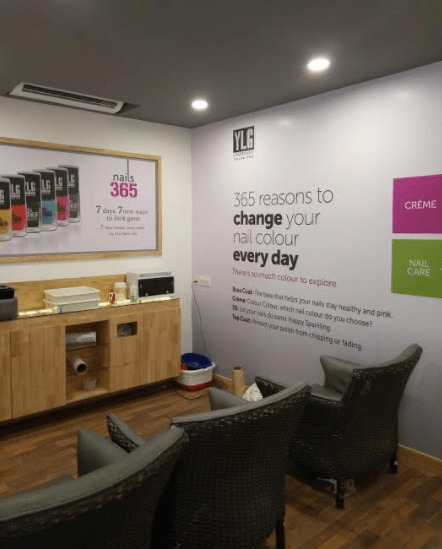 The interiors of the salon are done up in pastel shades of grey, white, cream and beige and the colour pop comes from the attractive wall features which accentuate the services at the salon. Neatly organised into various sections, the salon has separate rooms and areas for the various services. The staff are friendly and easy going and attentive to what guests need. As I had less time on hand, I decided to try the Classic Manicure a 20 minutes procedure that begins with applying a cuticle cream on the nails and allowing them to soak in warm water for 5 minutes. Ramya and Radha my therapists are enthusiastic and explain what they are doing and also ask me if I am comfortable through the session. Using a cuticle pusher my nails are pushed back and also cleaned and all the cuticles are then removed. After this the nails are shampooed and cleaned with a small brush. Post this shampoo, a scrub is used to massage the hands and then this is washed off. After this my nails were shaped and then a massage with cream for a few minutes post which all the residue was wiped clean. After this I was asked to select a nail polish of my choice which completed the nail care routine. The best part is that in 20 minutes I had hands that felt as good as they looked. The next treatment I tried was the Express Hair Spa also for 20 minutes which my therapist Divya did. Starting with a hair analysis she said while my scalp was good, my hair was frizzy and dry. So she started with a hair wash using a L’Oreal Purifying shampoo and conditioner to ensure any pollution impurities were removed. After this she applied a L’Oreal Primer Repair Lipidium on the length of the hair and massaged it in for 5-7 minutes. This is a pressure point massage done at the back wash area but for the comfort of the guest you are seated in an enclosed area. Post the invigorating massage the same was allowed to get absorbed into the hair for about 3-4 minutes. After this, my hair was washed with water just a rinse without the use of any shampoo or conditioner. An absolute repair serum was applied on the hair and not the scalp to ensure sunlight, dirt and dust would not be absorbed. This also protects the hair from damage and split ends as well. A quick blow dry and my hair was left feeling soft and smooth, a complete contrast from the dry and frizzy texture I had when I entered the salon. My therapist also suggested that I use an Absolute Repair Shampoo and Conditioner for dry and frizzy hair at home. The entire session was quick and effective and most importantly a great way to give yourself a makeover. Now that is certainly a big deal. So go ahead and make yourself feel wow at YLG. Timings: 11.00 A.M. to 8.00 P.M. Address: No.55, 5th Main, HAL 2nd Stage, Old Airport Raod, Kodihalli, Bangalore – 560008. Yesterday I have visited ylg website and gone through that. What a service ! we can book salon online appointment before going to women’s salon. Also multiple services are available such as facial, bridal, waxing, threading, spa and body massage, haircuts and nail polishes online store. yes its correct. i also had great experience there by last weekend.